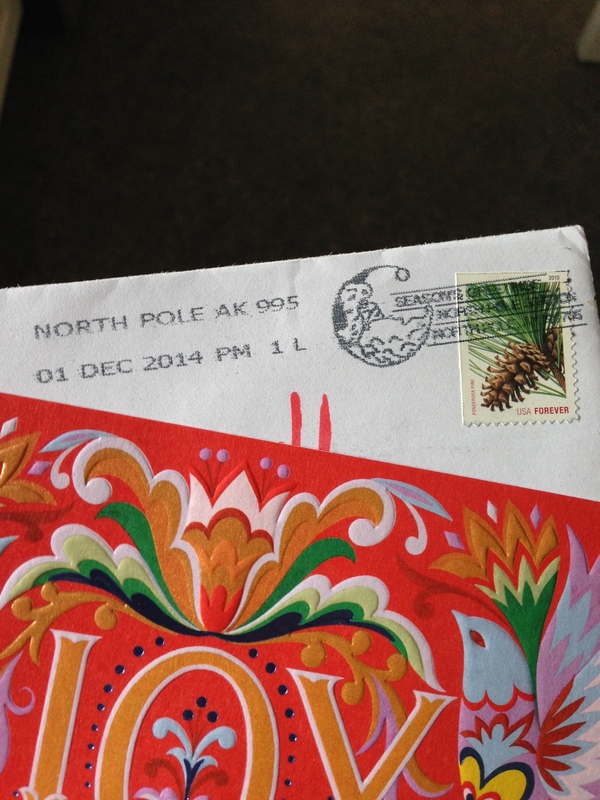 My first holiday card of the year came from the North Pole!! My pen pal Ryan must be the most organized holiday card sender ever because not only was his card the first card to arrive in my mailbox, but he sent his to North Pole, Alaska for the special North Pole postmark. As I sit with my holiday cards spread out on the floor, still stuck in the M’s of my address book, I am envious of Ryan’s accomplishment. But extremely happy to be on the receiving end of such a fun mail surprise! How are your holiday cards coming along? Update: Here’s an older Letter Writers Alliance blog post with all of the holiday postmark cities. If you are interested in doing this (next year? or as belated wishes this year?) I would contact the PO of interest to make sure it is something they are still doing. And…if you want to get a head start for Valentine’s Day, the LWA has another list for that. That is a cute idea. I never do holiday cards! I guess I’m a bit of a scrooge but I don’t really see the point of them. Aw, I love mail so the holidays are usually my favorite time of the year. This year, I feel too behind to enjoy it. I didn’t know there was a place in Alaska called North Pole! That’s too funny. How did he manage to send it there, and then to you? wow, thank you! That’s so cool– I didn’t know you could do things like that. How fun! Hope your cards keep coming so you enjoy your holiday mail!